We offer many options to choose from in types of closet cabinetry or shelving, color, finish, and closet accessories from our fine manufacturers--Organized Living®and Jay Rambo Co. 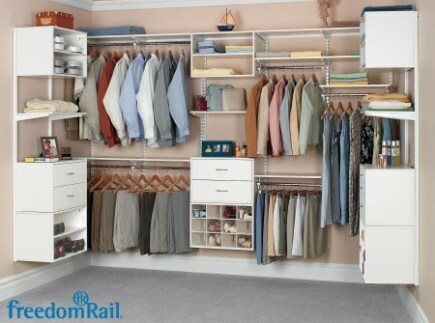 Whether you need storage components for your closets, pantry, garage, or basement, Organized Living® has the solution! Organized Living offers these distinct systems of storage solutions: Classica® and freedomRail®. Classica® is a storage system of elegant built-in cabinetry units for closets, home offices, garages, and more! 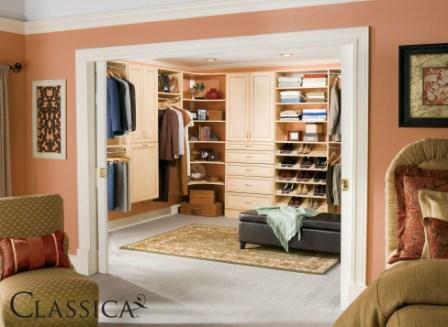 Beautiful and durable, Classica® is especially wonderful for master closets. 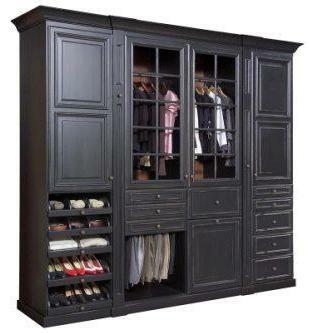 Fully organize your closet with a place for all your shoes, bags, ties, belts, folded items, hanging garments, and more! Made of 3/4" melamine and built for strength and flexibility, it has a fixed center shelf for sturdiness and offers the strongest cleats in the industry. With choices of depths, heights, unit types and accessories, it is truly customizable. Available in seven colors--White, Bisque, Modern Cherry, Chocolate Pear, and Cypress Live, Driftwood Live, and new Midnight Live. See the Photo Gallery for ideas using Classica®! freedomRail®, the Truly Adjustable Storage System® is a system that utilizes vertical rod supports hanging from horizontal rails. Shelving, organization boxes, clothes rods, drawers, and other components hang from the vertical rods. This system is very easy to install. With a few tools and a level, homeowners can quickly install it themselves if they wish. This sytem is great for kids' rooms because it is easily rearranged as children grow. It is also wonderful for other closets, pantries, mud rooms, home offices, craft areas, and laundries--even entertainment centers. Shelving is available in White, Modern Cherry, Chocolate Pear, Cypress Live, Driftwood Live, and new Midnight Live melamine. See the Photo Gallery for ideas using freedomRail®! Jay Rambo Company offers the ultimate in elegant custom-fitted luxury closets. Outfit your master closet with furniture-quality closet cabinets with all the function and organization features you expect and desire. Jay Rambo Custom Closets are constructed of veneered plywood in a choice of door styles, wood species and finishes. The options are virtually endless! Some of the possibilities are islands, drawer seating, tall pullout swiveling mirrors, wardrobe lifts, safe doors, and fold-out ironing boards. Accessories include rollout trays for ties, belts, slacks, or shoes, hampers, and inserts for jewelry, socks, belts or ties. Add sophistication with crown moldings and special door panels including plain, frosted or fluted glass, or louvered wood. With Jay Rambo, it is possible to design an entire master bath and closet suite--even a wardrobe for the master bedroom--with the same elegant coordinating cabinetry. See the Photo Gallery for more ideas using Jay Rambo Closets!